If you really love BBQ pork ribs but you just want to try something different for a change, then this new rib recipe is perfect. It's a really easy recipe to prepare, but the secret behind the full flavor when cooking these ribs is the overnight marinating time. You really need to let these ribs soak overnight to fully absorb the honey garlic and ginger flavors for maximum flavor. 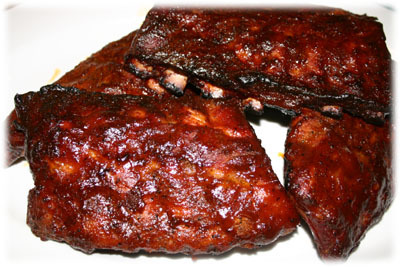 Believe it or not these BBQ ribs can usually be cooked in about an hour but that really depends on how big the ribs are and how hot you decide to run your grill. If you prefer "low and slow" then just add a bit more to your cooking time and lower the temperature. These make a great main dish but they can also be used as an appetizer. 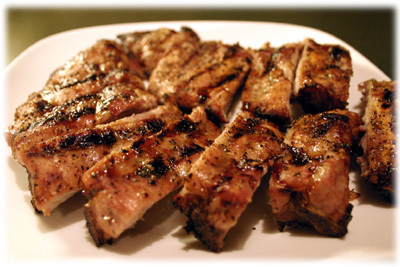 Just cut each rib into individual pieces after they're grilled and watch them disappear. Note: for best results let the ribs marinate overnight. 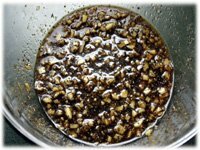 In a small glass bowl or resealable glass jar mix all the marinade ingredients well. 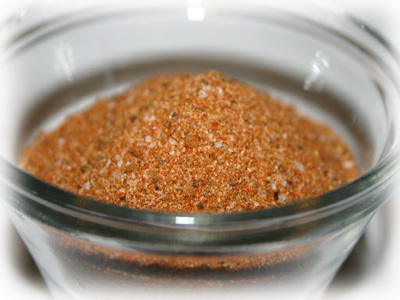 Let sit to allow the flavors to blend while you prepare the ribs in step 2. 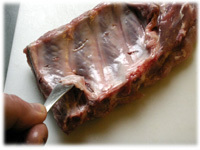 With the back of a teaspoon begin lifting the membrane on the back of the ribs near a bone. 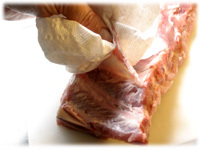 When you get enough of the membrane (also called 'silverskin') pryed up from the back of the ribs grasp it with a paper towel and peel it off. This membrane should always be removed, if it's left on it can cause the ribs to curl when they're cooking and they'll also be a bit tougher to chew when left on. Cut the two rib racks in half so you've 4 pieces. 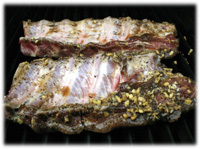 Place the ribs meat side up (bone side down) in a glass dish. Evenly distribute the marinade over the top of them and rub to completely cover all the pieces. 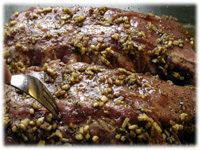 Pierce the meat with a fork all over after you've spread on the marinade - this will help the flavor penetrate the meat. Cover the ribs and refrigerate overnight. Oil the grates of the BBQ and preheat to 400F - 450F. 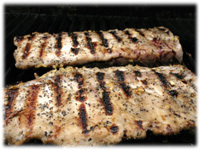 When the grill is ready place the ribs meat side down (bone side up) and close the lid. Let the ribs brown up and give them the charred grill marks - usually about 7 or 8 minutes should do. Flip the ribs over (bone side down) and close the lid. Let the ribs cook for 30 - 40 minutes and check on them occasionally. The meat should be shrinking back from each rib bone end 1/4" or so. Keep checking on them, you don't want them overcooked or they'll dry out. Depending on the size you're using really determines how long to cook them. The bigger and meatier they are the longer they'll take. 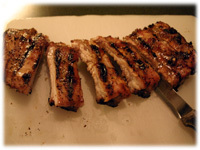 Remove the ribs from the grill and place them on a cutting board. Cut the ribs into individual pieces between the bones. It's easier if you do this bone side up so you can see where to cut. Serve this as is or with the special rib dipping sauce described above.